After looking at the new cmdlets shown in the presentation that accompanied VMWare’s recent announcement and discussing the announcement with my friend Dmitry, he mentioned how confusing things might become as more and more companies release cmdlets that don’t use product prefixes in their nouns. I agree with this to a certain extent, but there are pros and cons either way. 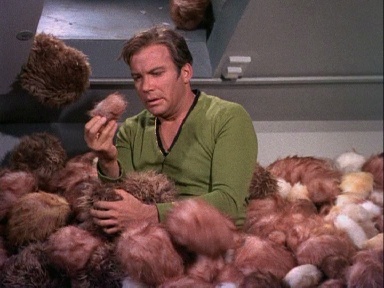 On one side, if someone develops a cmdlet that no one else has produced that will get tribbles as part of a Star Trek product, and if the type of tribbles they are retrieving are what 90% or more of the users would expect them to be, then why shouldn’t they name their cmdlet Get-Tribble? On the flip-side though, lets say they also have cmdlets to retrieve replicators, phasers, communicators, and tricorders and they also include a generic “get all” cmdlet that retrieves everything. As with the tribbles, if the replicators, phasers, communicators and tricorders are what 90% or more of the users would expect them to be, then they could name those cmdlets Get-Replicator, Get-Phaser, Get-Communicator and Get-Tricorder. But what about the generic “get all” cmdlet? Should they call it Get-Object? That certainly wouldn’t be intuitive for an end user. Maybe instead they should name the cmdlet Get-STObject, but then you could circle back and argue that for consistency the other cmdlets should be named similarly. This would result in them using Get-STTribble, Get-STReplicator, Get-STPhaser, Get-STCommunicator and Get-STTricorder as well. Those names then become clearly defined but not very pretty to look at (especially if your product name is actually Star Trek: The Next Generation and you have to distinguish your cmdlets from the Star Trek: Deep Space Nine product cmdlets, in which case you might have to name them Get-STTNGTribble, Get-STTNGPhaser, …ugh!). I think this approach would give the best end-user experience for both snapin developers and script authors. Snapin developers could continue to publish cmdlets, functions and aliases using intuitive, meaningful names without having to worry about prefixes. Script authors could write scripts using intuitive, self-documenting cmdlet and function names. This seems to be the best of both worlds. Does anyone have other suggestions? Microsoft, what do you say, can we get namespace and using keyword support in 2.0? P.P.S. Hey, maybe someone should make a PowerShell-based MUD! You could script everything you do (not that you can’t in existing MUDs, at least to some extent, but it would be cool to see it in PowerShell, at least to me)! Previous Post The train has left the station…are you on it?